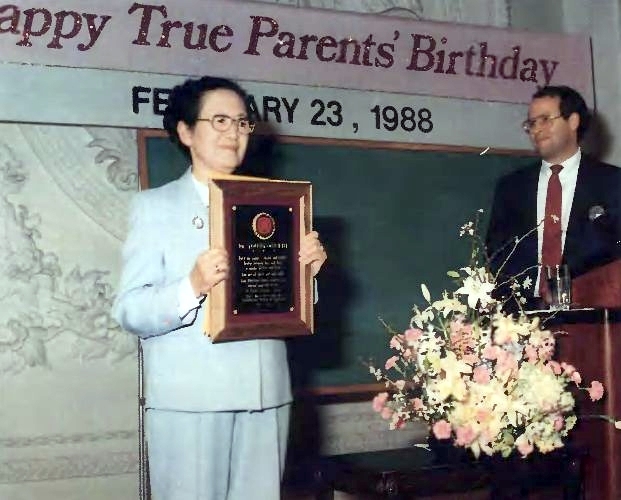 Dr. Young Oon Kim holds up the commemorative plaque she received at her Farewell Celebration on February 23, 1988. 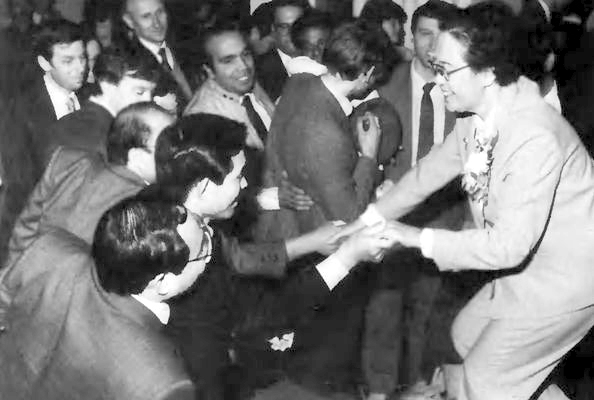 On the afternoon of True Parents' Birthday, February 23, 1988, a special farewell celebration was held in the Grand Ballroom of the World Mission Center in honor of Dr. Young Oon Kim, the first missionary to America. After serving faithfully and sacrificially for 29 years in America as a pioneer, a writer, a professor of theology, a lecturer, and an elder sister of profound depth and wisdom, she was being asked by Father to return to Korea. Many leaders and members attended the celebration. First Dr. Kim gave her profoundly moving testimony and then various leaders shared a few words about how her spirit and her love have touched their lives. You are all these and much more. its eternal gratitude to you. 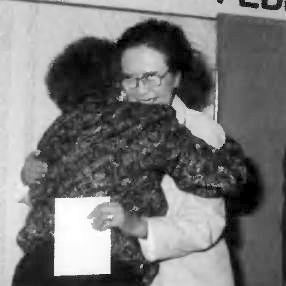 A cake with the words "In remembrance of all you have done--January 4, 1959, through February 29, 1988" was brought out in her honor, and she also received a monetary gift donated by brothers and sisters in the United States. The following are excerpts from remarks given at the event. Even though I never had much time to work together with Dr. Kim, I have deeply respected her ever since I was a member working in Japan. Sometimes she came to Japan and spoke to the members, and whenever she did I was always impressed, and I could never forget her. When I listened to her testimony for the first time a few days ago, I was amazed to hear about her spiritual experiences. I had similar experiences with Jesus and the Holy Spirit, and a similar kind of conversion. That might be the reason why, even though I never spent a substantial amount of time with her, I feel so connected to her and respect her so deeply. On this occasion, I would like to express my gratitude to her on behalf of all the Japanese brothers and sisters in America, but also as an individual, from my own heart. Recently we invited Dr. Kim to speak to about 40 ministers. She gave the same contents as she did today. She has no hesitation to speak the truth. I was worried at first, but actually, she completely won the hearts of the ministers. They were greatly impressed and started to think deeply about Father. I realized that the reason why the ministers were so moved by her was because she has lived a life of complete honesty and integrity, which wins people's respect and trust. Religious people surrender under her heavenly dignity. Not everyone can speak the truth so plainly. But when she speaks, people listen. I feel that is why she is being called to go back to Korea. I feel we are sending her off to start a new mission to accomplish an even more important role in Korea for the sake of the world. Therefore, from the bottom of my heart, I want to express my gratitude and my happiness for having known her. We might be physically distant now, but our hearts will always be one. My first experience with Dr. Young Oon Kim was through one of her books. In the early 60's she wrote a book on the Divine Principle, and I was given that book when I first joined in San Francisco. It was a little blue book. This book was obviously a labor of love. It had been typed out on an old IBM secretarial typewriter and very carefully bound. It had been edited in such a way that words that were not appropriate had been pasted over with other words so that the book was full of little patches, but done very carefully. After listening to the lectures at the center, I would go back to my apartment at night and I'd read that book. I began to have deep spiritual experiences through reading that book. I longed from that time to meet the author. That book was very clear, very much to the point, and very sincere, just like Dr. Kim herself. It really opened the door for me toward understanding the Principle. My first actual meeting with Dr. Kim was a scary affair for me. It was when our Father and Mother visited America in 1969. At that time I was the director of the San Francisco center under Mr. Sang Ik Choi, and I had been chosen to give a bouquet of flowers to Mother as she came off the plane. Dr. Kim was organizing the entire welcoming committee. She had given me the bouquet of flowers and was standing right across from me. As a young member, I felt very responsible and wanted to do well in the presence of such a revered elder as Dr. Kim. But as I waited for Father and Mother to come up the gangway, I realized I'd never seen Mother before. Suddenly, they appeared. Father was walking next to Mrs. Won Pok Choi, and Mother was following behind. I honestly thought that Mother was a servant. Since Mrs. Won Pok Choi also looked more Father's age, I thought she must be Mother. So I promptly gave the flowers to her. Dr. Kim just flew at me and said, "You gave the flowers to the wrong person! That's not Mother!" I was so shocked I thought I was going to go to hell on a bobsled! Over the years I've had numerous opportunities to meet with Dr. Kim, most recently at the Seminary, where she lived in an apartment on one of the lower floors during her many years of teaching there. I've come to know her as a person of incredible depth and heart. She doesn't always express it outwardly. I think Americans are more accustomed to people who just bring it all out in the open, but Dr. Kim's heart goes first to God and to True Parents. She's not concerned about herself or what people think about her. She is a person who above all loves God and loves the truth and loves our True Parents very deeply. I've always felt her to be, in a sense, like an aspect of Father's own heart that he isn't so free to express. I have to confess that many times when I was up at the Seminary I tried to think of some good reason to go visit her in her apartment, just so I could be with her and share a cup of tea. I think I probably speak for many people in the American movement when I say that; I don't speak for myself alone. Being with her is literally like being with a part of our True Father. I was always grateful for even 10 minutes in her apartment where I could just sit down and bask in that warmth. She is going back to Korea to continue her mission and to expand on it; Father is not going to let her rest, I know, until the final rest, and even then I know she's going to be very active. On behalf of all of our American membership, there are no words to say "Thank you" for her many years of giving everything she has. She is both a very productive woman and a truly exemplary person in the service of God and our True Parents, and we want to thank her very deeply. Dr. Kim is given many heartfelt handshakes at her Farewell Celebration. You know, you have all said that I did so much work here in America. I don't feel that way at all. 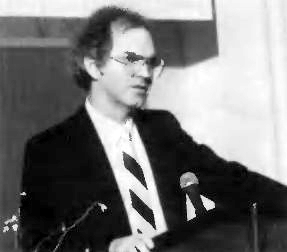 I did three kinds of work in this country: pioneering missionary work, writing, which took a lot of time and energy, and education. But in every field, I received lots of spiritual help. Without that spiritual help I am just an empty pipe. So I don't feel I have done anything. If anything has been done, it's He who has done it, not me! Anyway, this is my gift to you. Really, the mature and golden period of my life was spent in America. I cannot forget America, because half of my life is interwoven with America. How can you forget half of your life? [On receiving the monetary gift from Mrs. Nora Spurgin representing the American family.] You have fed me for 29 years, sheltered me for 29 years; I should be the one to give to you! Mrs. Nora Spurgin embraces Dr. Kim. I'd like to say one thing in response to Dr. Kim's saying that we have fed her. I remember when Dr. Kim first came to America, she worked as a babysitter in order to support her work, so that she could both go to school and write the Principle, as well as witness. Here was a great lady, a college professor, taking care of someone's children just so that she could earn enough money to begin her precious work here, bringing Father's words and life to America. We are incredibly indebted to her. I don't think any of us fully understands how humbly she came and served us, even to the very end.